One day, when Ian and I still lived near Nashville, he needed a sudden favor that involved my taking an impromptu trip to Fort Campbell, KY, about a 45-minute drive. 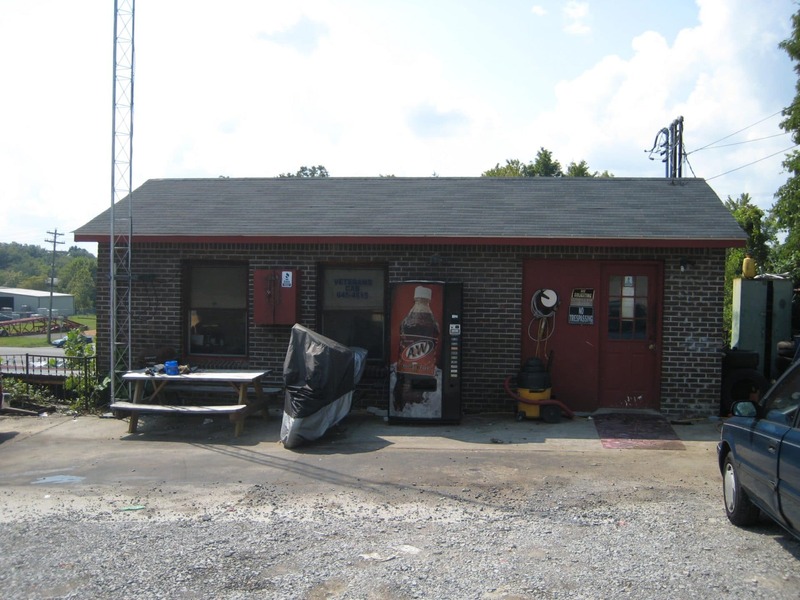 I had an early copy of Pretty Much True I wanted to bring to the Clarksville cabstand dispatcher, known in the book as “Shellie.” (Her real name is Sheila. I know – hardly a creative adaptation. What can I say? Her name just fits her.) She is, without exaggeration, the sunshiniest person I’ve ever met. A widow, she’d pulled herself through the loss and gone on to do this thing we call “living.” Boat trips on the river, lusting after Mister H. (the man who sold fresh vegetables on the corner at the bottom of the cabstand’s hill), taking care of her dog Puddin’ (name not changed for the book), and taking pride in her trailer, the homiest looking one in the otherwise dingy, dogs-chained-outside lot. Sheila’s also sweet. Too sweet. “You catch more bees with honey,” she said when I asked why she didn’t stand up for herself more. Some of the other dispatchers would take advantage of Sheila — because it was easy. And I was no better, I suppose. I was a grumpy driver, at times. There are those days…sometimes you can only take so much, when it makes you sick to keep driving a guy who says it’s his dog lying dead, there, at the corner, and naw, he’s not too worried about it because he got another one. I figured I owed her a book, at the very least. And I thought she might like that she’d inspired a character. 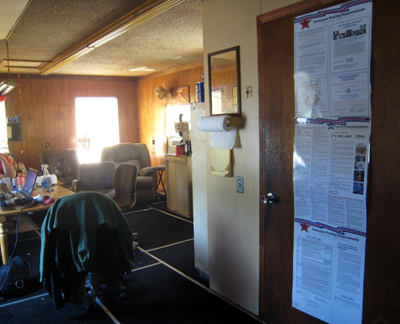 The first stop was Fort Campbell, but after that, I drove through Clarksville and pulled into Sheila’s trailer park. I thought I’d see if she was home in case she didn’t work Fridays. (It was on the way.) I didn’t see her bright blue pickup; instead, there was a minivan parked outside. New car? I got out of my car and walked up to the door, knocked, then looked through the window of her outdoor porch. Kids’ toys. Nope – she didn’t live there anymore. My guess: she shacked up with Mr. H.
Construction on the only main road that would take me from Sheila’s to the cabstand made that road’s normally heavy and slow-moving traffic (a two-lane, this) downright ridiculous, but it cleared out, as it always does, on the road that follows the Riverwalk. 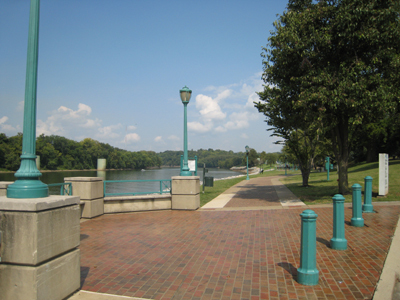 The Riverwalk is where Pretty Much True‘s protagonist, Mia, parks her taxi for a break from driving (rather, the fares) and remembers her deployed boyfriend, Jake, taking her there for a picnic. He pulled out two beers in cans, labels hidden by cozies, and handed me a cold, soggy drumstick. The door stays closed to keep in Puddin’ and the dramatic lines of an eighties show bouncing off grime-coated walls. “We must find the size 9 shoe,” urges a TV detective. I cover my nose with my sweater cuff, pretending it’s for warmth. The cab stand was just as smoke-thick when I visited. I smoked a contact cigarette while asking the dispatcher if Sheila still worked there. “Wisconsin?” I said. She would often talk about Wisconsin, where she lived before moving to Tennessee. After that, there really didn’t seem to be a reason to stay. At the bottom of the hill, not far from a pickup truck bed loaded with baskets of potatoes, Mr. H–wearing a straw hat that shaded his blue eyes–sat on a swinging, shaded bench. A woman his age–80, 85–sat with him. I asked him about Sheila. He didn’t know what had happened (my guess is a heart attack; she’d had a bypass years before), but said he’d heard about her dying two years ago. “I thought highly of her,” he said. Sheila’s not someone who would care too much about dying. “My time’s up when it’s up.” However, I’m happy she–and her way of saying “tomatoes” (tuh-may-ters)–keeps living in print. She’s someone who simply should.